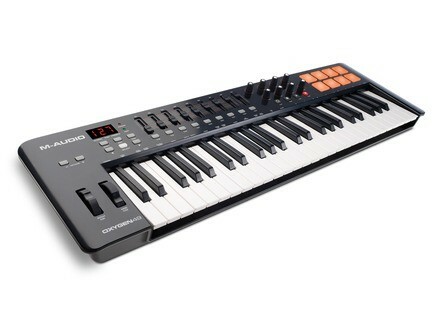 Oxygen 49 MK IV, 49-Key MIDI Keyboard from M-Audio belonging to the Oxygen (2014) model. 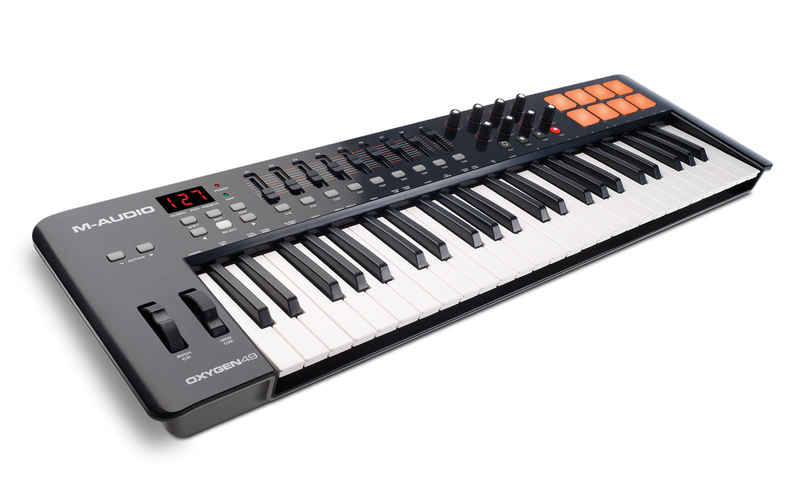 • With what configuration, software and other gear do you use this MIDI controller? In what context and for what musical genre(s)? What are your thoughts on its stability and durability? Most of the time, I use it with my Macbook pro and cubase artist 8.5 in my home studio. The keyboard is stable, I’ve had no problem with it. .
• Are its controls and features ergonomically designed? Is MIDI mapping straightforward? The design is very ergonomical, and most important the knobs are NOT endless ! As far as the mapping is concerned, it’s very easy to do. • What do you think about the feel and function of its keys and pads? Do they permit you to play with precision? Are they lacking in any way? Why or why not? Well, I must admit i’m surprised as i fin dit sturdy and well-built, even if it’s only plastic and a real lightweight! The keys’ quality is average-to-good, and their size allow to play it correctly and precisely – and also allow me to put fluorescent tape on it to mark my settings. Reading the manual carefully makes it easy to set the keyboard as you like, I can easily keep the settings for my Arturia (and others) virtual synths. • What are the pros and cons of this MIDI controller? The price is quite reasonable, and the keyboard’s general quality is correct.